Tax credit programs allow businesses and investors to claim tax credits for committing resources to a project or business. Several different types of tax credit programs exist at the federal and state levels to encourage investments in redevelopment projects, affordable housing, specific industries, and communities of all sizes. 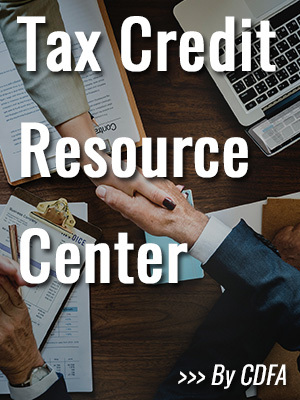 The Tax Credit Finance Resource Center provides information about the various tax credit programs available and how they can be used within the context of development finance. Tax credits directly reduce a tax payer's tax liability and are not a deduction, thus making them a very desirable and effective tool. They can be used in urban, rural and suburban communities, and in some cases on a regional basis. They can also provide a targeted impact by addressing many different community sectors, such as low-income neighborhoods, historic districts and under-served markets that present opportunities for new investment. There are three main federal tax credit programs: New Markets Tax Credits, Historic Rehabilitation Tax Credits and Low-Income Housing Tax Credits. There are also numerous state tax credit programs available, which can be found in the map provided in the resource center below. In order to receive a tax credit, an investor must first demonstrate that an investment has been made. Such a resource commitment could be an investment in a bricks and mortar real estate project or a cash investment in a business. The distributor of the tax credit is authorized to issue credit based on the actual outlay of resources as evidenced by the investor. Tax credits can be used for several purposes in development projects: to provide an increased internal rate of return for investors, to reduce the interest rates on a particular financing package, and perhaps most importantly, to provide a repayment method for investors in place of cash. In the latter case, the credits can often be sold on the secondary market to generate income. Want regular updates on tax credits? Subscribe to CDFA's Tax Credit Finance Update newsletter. Interested in learning more about Tax Credits? You can read a descriptive Overview of Tax Credits here. We've also compiled a few helpful resources below. In the January 2011 issue of the Novogradac Journal of Tax Credits, Michael J. Novogradac outlines this basics of low-income housing tax credits, renewable energy tax credits, historic tax credits, and new market tax credits. In light of 2010's increased scrutiny on tax expenditures, Novogradac points out that these tax credits provide far-reaching social and economic benefits at the national, state and local levels. This fact sheet, provided by the New Markets Tax Credit Coalition, provides a basic overview of the federal New Markets Tax Credit Program. This fact sheet, provided by the Office of the Comptroller of the Currency, provides an overview of the Low-Income Housing Tax Credit (LIHTC) Program. Elements include how the credits work, how they are awarded, and how LIHTC projects can provide Community Reinvestment Act consideration. This booklet, provided by the National Parks Service, provides an overview of the National Historic Preservation Tax Incentive Program in general terms only. Charlie Bartsch with ICF International looks at creative ways to finance brownfields redevelopment under tighter credit markets. The report looks at financing vehicles such as historic rehabilitation tax credits, new markets tax credits, energy efficiency construction tax credit incentives and low-income housing tax credits to provide financing for these programs. Charlie Bartsch with the U.S. Environmental Protection Agency covers a slew of federal financing programs available to support local economic development initiatives. Bartsch provides case studies and examples of how various programs can be applied locally. Jim Walker discusses how the ability of the NMTC program to expand the availability of credit, investment capital, and financial services in distressed urban and rural communities makes this financing tool a viable option for brownfields redevelopments. Through best practices and case studies, this session examines the NMTC structure that's been shown to produce financing and attract developers to brownfield projects in Florida. Mitch Rosenstein discusses how the workforce housing movement is building in Florida and talks about the different financing tools that can be assembled to address the gap needed to make workforce housing and affordable housing available. The NMTC Program is provided by the CDFI fund to attract private capital into low-income communities by permitting individual and corporate investors to receive a tax credit against their federal income tax in exchange for making equity investments in specialized financial intermediaries called Community Development Entities (CDEs). Mary Nash Rusher of McGuireWoods LLP, Chris Leutzinger of SunTrust Bank, and Brian Oxford of CAHEC present on a panel regarding tax credit financing in North Carolina. This panel was moderated by Brien Desilets of Grant Thornton LLP. For partners in the $17.5 million L.A. Prep project, the recipe for a successful food business accelerator calls for equal parts social philanthropy, economic development and collaborative synergy. L.A. Prep was financed using $16 million in NMTC allocation from the Los Angeles Development Fund and from UrbanAmerica..
During this installment of the CDFA // BNY Mellon Webcast Series, Lillian Plata with Nee Plata Law LLC presented on the structure of tax credit unwinds for New Markets Tax Credit and Low-Income Housing Tax Credit deals. The Federal Historic Preservation Tax Incentives program is provided by the National Parks Service to encourage private sector investment in the rehabilitation and re-use of historic buildings. The Low-Income Housing Tax Credit (LIHTC) is provided by the U.S. Department of Housing and Urban Development to encourage and support the development of affordable housing in the United States today. This report, produced by the Urban Institute, explores why LIHTC is a critical part of the housing safety net. The report details how and why the program has succeeded, the challenges it faces, and why the program is more important than ever. The changes and trends in the affordable housing industry have a large impact on Wisconsin communities. Continuing to provide an adequate number of homes affordable to low and moderate income households is increasingly difficult. Luckily, there are a number of financing strategies for these developments. Sarah Greenberg with Forward Community Investments discusses CDFI support for affordable housing development in Wisconsin. The changes and trends in the affordable housing industry have a large impact on Wisconsin communities. Continuing to provide an adequate number of homes affordable to low and moderate income households is increasingly difficult. Luckily, there are a number of financing strategies for these developments. Wyman Winston with the Wisconsin Housing and Economic Development Authority discusses the latest in the Wisconsin housing market, and how agencies are responding to low income housing tax credit market changes. The changes and trends in the affordable housing industry have a large impact on Missouri communities. Continuing to provide an adequate number of homes affordable to low and moderate income households is increasingly difficult. Luckily, there are a number of financing strategies for these developments. Stuart Bullington with the City of Kansas City and Dan Moye with the Economic Development Corporation of Kansas City, MO discuss the latest in the Missouri housing market, and how agencies are responding to low income housing tax credit market changes. Search the map below for tax credit programs by state. This specialized search is part of CDFA's State Financing Program Directory, the only online resource cataloging the development finance programs offered by state governments. Click on a state to see a sample of state tax credit programs available. Login with a CDFA Member account at the top of the page to view full results. Tax credits are flexible and can be used at many different levels. CDFA has collected over one hundred case study examples. This issue brief describes some of the notable research on Tax Increment Financing and reviews the challenges associated with the use of this technique. This issue brief is written by Natalia Ermasova and Amanda George from Governors State University. The Hatchery Chicago is a non-profit food business incubator that enables local entrepreneurs to build and grow successful businesses. Accion, the area’s largest microlender, and ICNC, which runs one of the largest business incubators in the country, are the joint venture partners and building owners. The City of Chicago and its affiliates provided a portion of the land, grants, tax increment financing, and new markets tax credits to help reduce the debt the project must carry. Communities throughout the country use tax credits every day and CDFA collects headlines on projects and news daily. CDFA Offers two tax credit courses on an annual basis. The Intro Tax Credit Finance WebCourse examines the application of tax credit programs in greater economic development finance efforts. This course will discuss the practical application of tax credit programs including brownfields, new markets, low income housing, historic preservation, and state-specific programs. The Fundamentals Course will help you understand the variety of development finance tools available, from bonds, tax credits and TIF, to federal financing programs, RLFs, and access to capital lending resources. During this installment of the CDFA // BNY Mellon Development Finance Webcast Series, our expert speakers provided an inside look into how New Markets Tax Credits can be leveraged and considered opportunities that the double allocation round creates for qualifying projects. During this CDFA // BNY Mellon Development Finance Webcast, explore financing programs and investment strategies that Newark, New Jersey has employed to encourage redevelopment in the city. In this edition of the CDFA // BNY Mellon Development Finance Webcast Series, Ellen Harpel from Smart Incentives, Dan Breen from Jones Lang LaSalle, and Heidi Springer from New York Grant Company each give their perspectives of the incentives landscape. As part of the CDFA Brownfields Technical Assistance Program, this third installment of the Brownfields Financing Webinar Series focuses on the recent allocation of $3.5 billion in New Markets Tax Credit awards by the U.S. Treasury Department’s CDFI fund and the significant potential this tool has to support the financing of brownfields cleanup and redevelopment. Written in conjunction with Ice Miller LLP, the Tax Credit Finance Reference Guide examines how to effectively apply tax credits to development opportunities, and explains the basics of tax credits and the fundamentals of using these tools. In addition, the guide walks through the pros and cons of using tax credits along with the guidelines for completing due diligence, performance monitoring, and benchmarking success. This comprehensive Reference Guide discusses in detail the primary tax credits available at the federal level, along with certain state tax credit programs, and includes numerous case studies of successful tax credit projects. The Practitioner's Guide to Economic Development Finance 2nd Edition is the only comprehensive resource dedicated to building and utilizing the development finance toolbox. The Practitioner's Guide provides the insight and practical information needed to critically understand how economic development is financed and the tools, strategies and techniques used to build strong communities. From bonds, tax increment finance and special districts to tax credits, seed & venture capital, revolving loan funds and much more, this Guide outlines the financing tools required for succeeding in today's competitive economic development climate. Unlocking Capital: A Handbook for Becoming a High Performing Development Finance Agency (Handbook) serves as a companion to the Practitioner’s Guide to help illuminate the structures of development finance agencies (DFAs), essential conduits to access development finance tools. The Handbook provides an overview of DFAs and their myriad roles in various development efforts. Included in this discussion is a comprehensive look at over a dozen high-performing DFAs throughout the country. The Handbook is designed to be a starting point for local leaders to engage in the creation or acceleration of a DFA to build and utilize the development finance toolbox. The DFCP Complete Book Package contains all of the reference guides to study for the DFCP final exam at a 10% discount. The Handbook is designed to be a starting point for local leaders to engage in the creation or acceleration of a DFA to build and utilize the development finance toolbox. The Practitioner's Guide provides the insight and practical information needed to critically understand how economic development is financed and the tools, strategies and techniques used to build strong communities. The Tax Credit Finance Reference Guide provides an exploratory overview of how communities can use tax credit finance programs to support economic growth. This guide examines how to effectively apply tax credits to development opportunities, and explains the basics of tax credits and the fundamentals of using these tools.